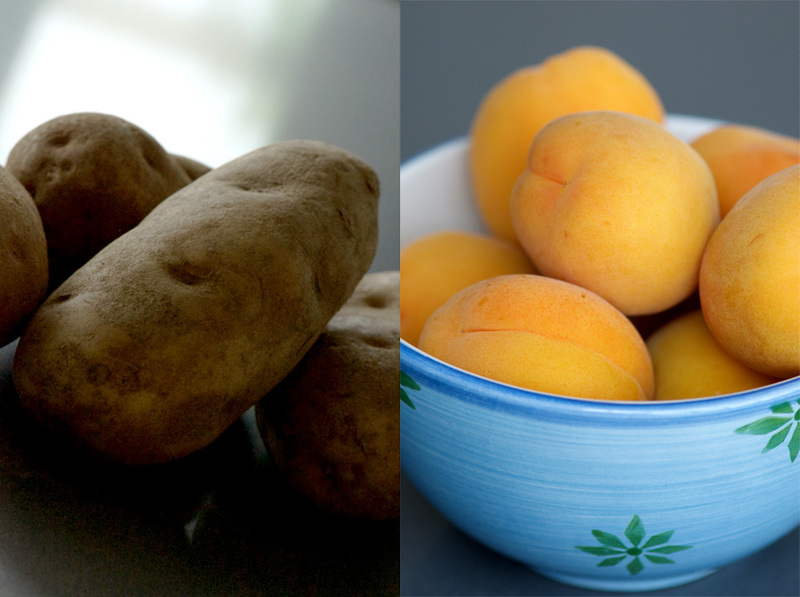 Imagine your knife cutting through a soft, pillowy dumpling to reveal a juicy, fragrant, perfectly cooked apricot. You sprinkle with sugar to sweeten the fruit, and take your first bite. 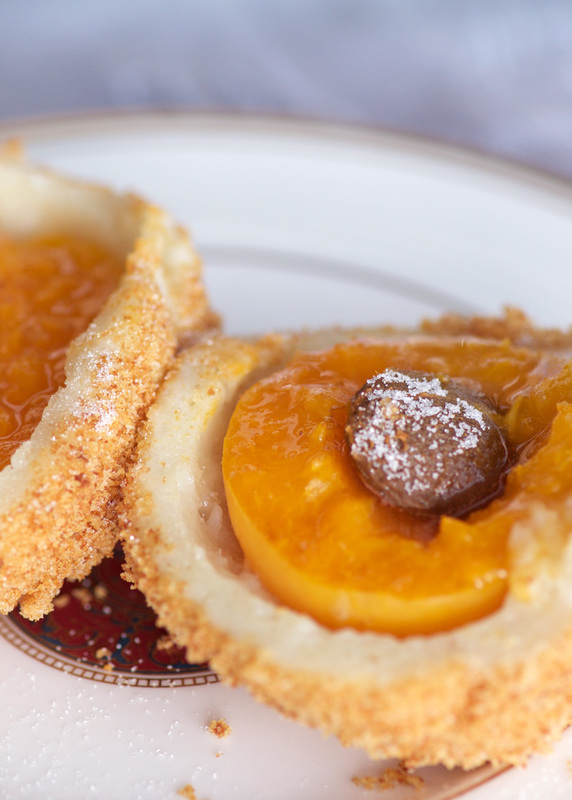 The crisp sugary breadcrumbs hug the dough and the sweet apricot flavour fills your mouth. This is the Schvetskin experience we enjoy as a special ritual every August when the apricots are at their peak. 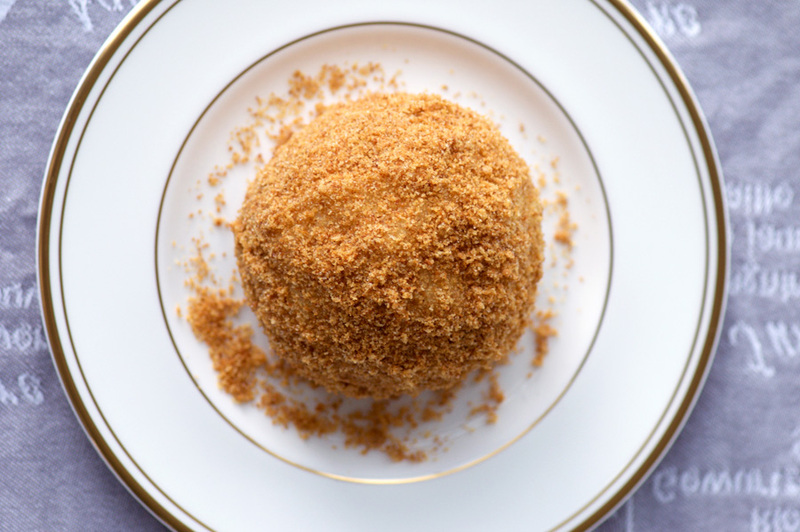 From humble ingredients—potatoes, breadcrumbs and apricots—you can make a delicious dessert that is hearty enough to be a light meal on its own. While they may be officially known as Marillenknodel, we’ve always called them “Schvetskins”. You see, you can also make these with other fruits like plums or even cherries. The plum version is called Zwetschgenknoedel, which growing up sounded a lot like “Schvetskin-knoodle”—and the name stuck. So now, any fruit dumplings of this sort, we just go with “Schvetskins” which is easier for us Anglophones to remember! For many years, Schvetskins were my nemesis. I could not get them to turn out for the life of me. They would always fall apart while cooking and turn into a terrible, goopy mess. I finally figure it out, I wasn’t using enough flour. Too much potato, and your dough will be sticky and fall apart when boiling. Even with a recipe, it can vary depending on your potatoes, humidity and other factors, so this is one you need to develop a bit of a feel for. I’ve included lots of photos to show the texture you are looking for. When in doubt, just add more flour. Better a little on the firm side, than falling apart! So once you have “riced” your cooked potatoes, you add flour, egg, salt and cream of wheat. I mix it with a fork at first, then you have to get in there with your hands and knead it. 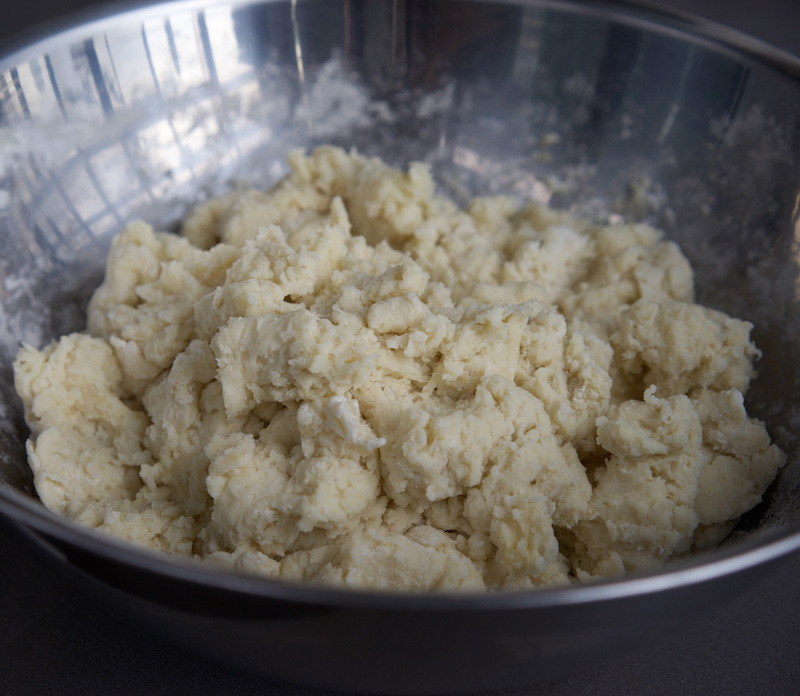 Below is a closeup of the dough to help show the consistency. It should only be a little bit sticky, and hold together into a firm shape when pressed. Once you have the dough ready, roll each whole apricot into a little bit of flour. 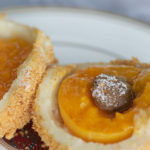 Take a handful of dough, and flatten it into your hand so it is big enough to wrap around the apricot (smaller apricots are ideal to use here). 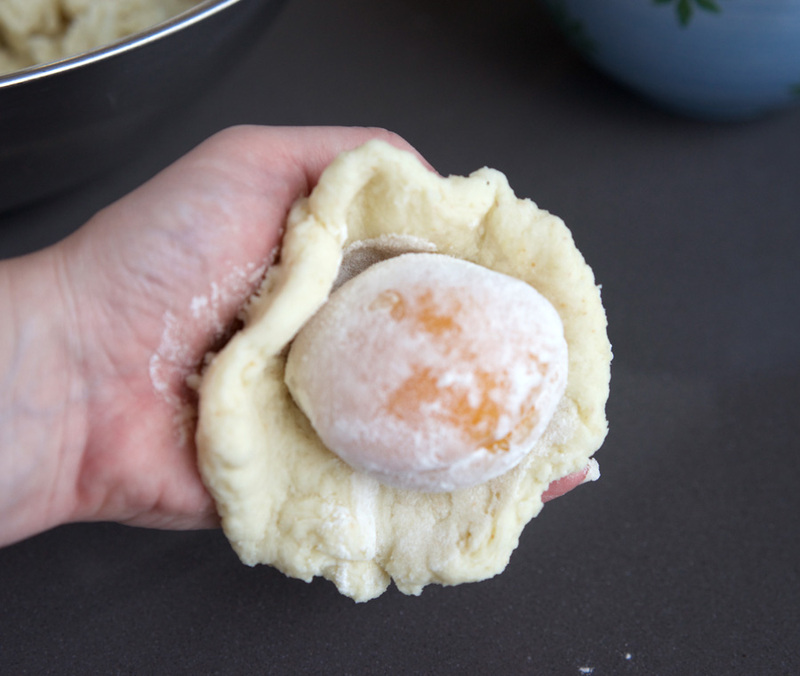 Fit the dough around the apricot and press it together so there are no gaps—this is important as you will be boiling them later so you can’t have any water getting in. If you are finding that the dough is tearing and not forming well around the apricot, you probably need more flour. Roll it in your hands a few times to even out the dough and press out any air gaps that may have formed between the dough and the apricot. Set on a plate while you make the rest. Once you have used all the apricots, there is usually some dough left. This is perfect for what we call “wutzels” (I don’t even have a story of where that name comes from, just go with it!) This is where you just take a small amount of dough and roll it out to the size and shape of a plump finger. Make a bunch of these and cook them with the dumplings. Once they are all ready, get a large pot of water boiling on the stove. Not a rolling boil, as the dumplings are a wee bit delicate; you want a nice, steady simmer. Gently drop the dumplings (don’t forget the wutzels!) into the water. While they are cooking (usually takes about 20–25 minutes), pull out a large skillet and melt some butter. Add the breadcrumbs and white sugar, and cook on medium-high heat to toast the breadcrumbs. Be careful here, I find it tends to go very slowly at first, so I’ll walk away and ignore it for a while, only to come back to find it on the edge of burning. Once they get going, you need to stir frequently to avoid burnt crumbs on the bottom of the pan (or turn the heat way down). When the dumplings start to float in the water, they are almost done. I give them about 5 or so minutes after they start floating, and then out they come and straight into the breadcrumbs. Many recipes call for the removal of the pit, to be replaced with a sugar cube. I find it much easier to just cook these whole, and remove the pits while eating. Adding sugar to your own taste is nice, and I find you can sprinkle it more evenly over the fruit that way. Have you tried making Schvetskins? If so I’d love to hear what you thought of them! 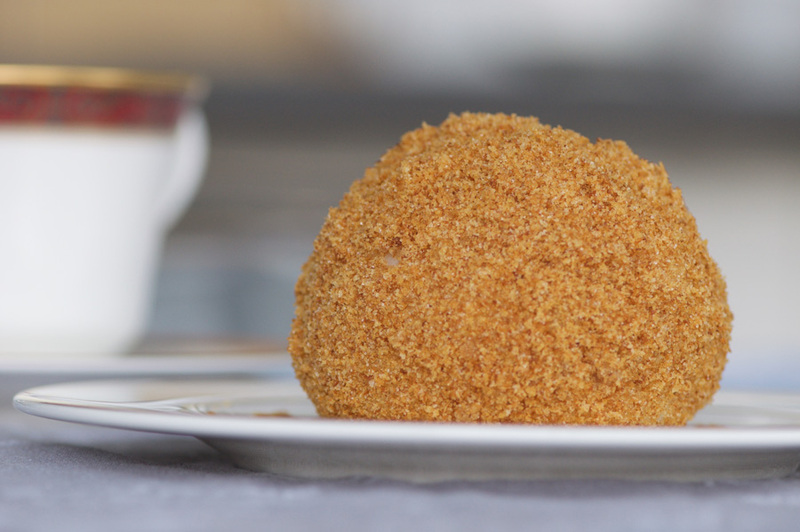 A traditional Austrian treat otherwise known as Marillenknodel. Boil whole potatoes with skin on until cooked through. (Leaving the skin on keeps the potatoes more dry). 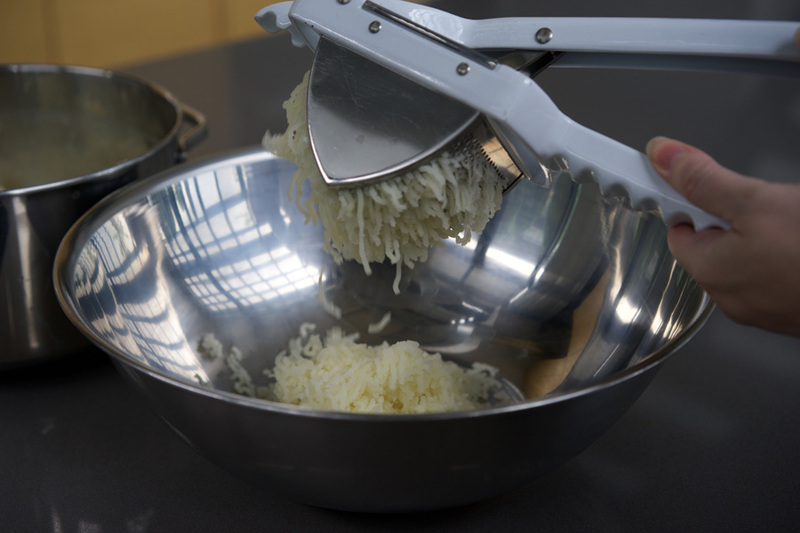 Remove skins and process through a potato ricer (or mash very fine until no lumps remain). Place into a large bowl. Add flour, cream of wheat and eggs. Blend with a fork until mostly combined, then knead into a dough. Texture will be slightly sticky but it should be fairly firm and able to hold together well. 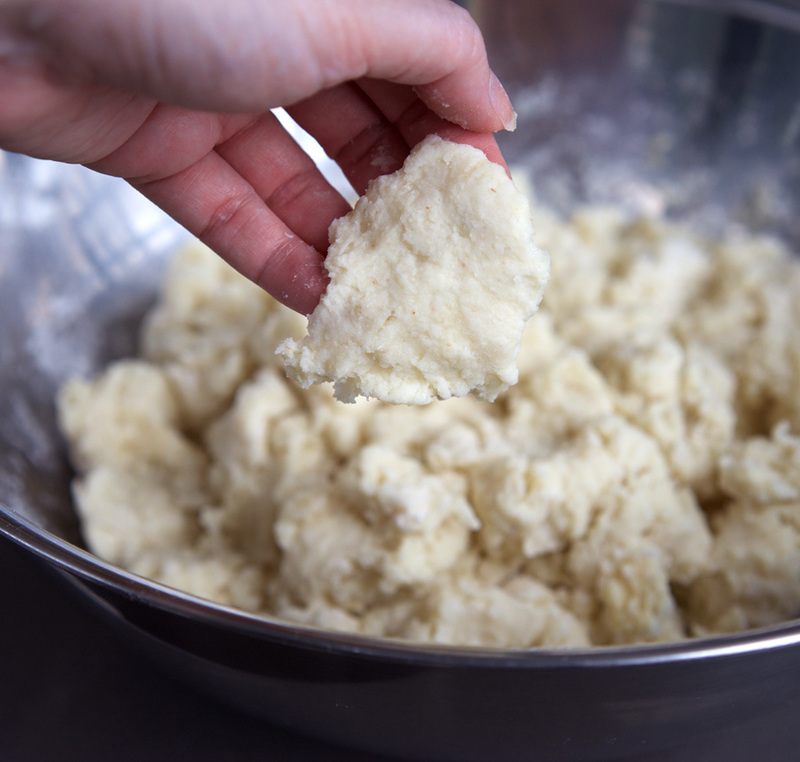 Roll any leftover dough into "wutzels"--finger length dumplings without any fruit. Place a large pot of water to boil on the stove. 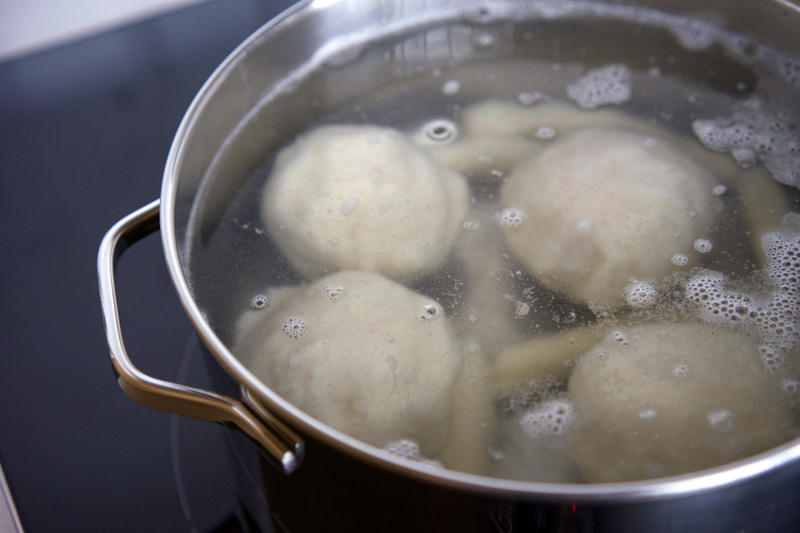 Bring to a gentle boil, and drop dumplings carefully into the water, along with the wutzels. Cook at a simmer for 20–25 minutes. When the dumplings float to the top of the pot, give them about 5 more minutes and they will be cooked through. Meanwhile, melt butter in a large skillet. Add bread crumbs and sugar. Cook until the crumbs are a nice deep golden colour. 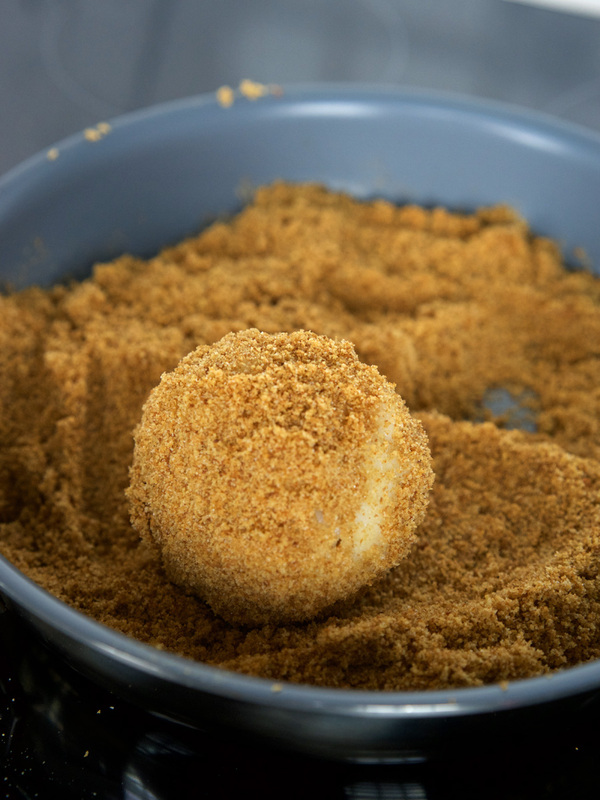 When dumplings have cooked, add them straight to the breadcrumb pan and roll them to coat. Serve immediately with sugar on the side to sprinkle on the cooked fruit.